This deer egg cozy is of course also a "dear egg cozy". It is cuddly, nice and warm, likes to keep eggs warm and decorate your table and add some Alpine style to your home. To do this egg cozy use the template provided by lovely Cherry from Tales from Pixiewood and dearest Yvonne from Yvestown (see Easter Bunny Cozy Project). 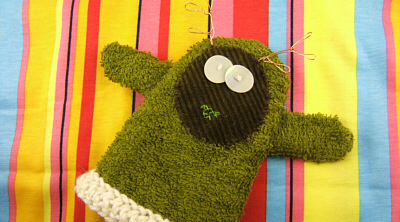 The Alpine Egg Cozy version – uses the ears to form two legs. As deer antler you might use some felt or, as we did it some copper wire. We used cross stitches to form the mouth and some mother-of-pearl buttons for the eyes. Have fun making your own stag to warm your morning egg. 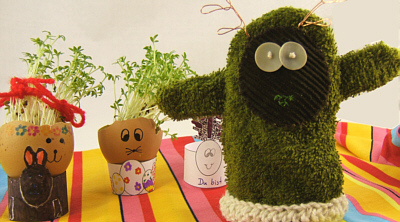 If you like the surroundings of our deer egg cozy have a look at the tutorial for cress heads and the how to to make your own egg cups.